How many times have you had to navigate to Ganttic’s many support channels to access information regarding a new feature or latest news? This week, we have made it possible for you to keep up with Ganttic’s news and feature launches in your very own planner. The planner info tab provides you with more flexibility and transparency. 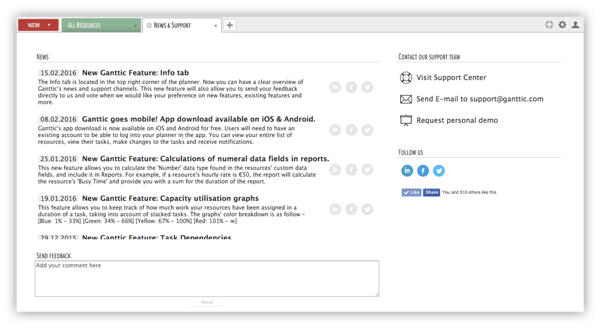 To access this feature, click on the ‘Help & Feedback’ icon on the top right of the planner. Instead of the dropdown that we used to have, you will now be greeted with a tab. In this tab, the News section takes up majority of the screen. Scroll down to view older news, or click on the social media buttons on the right to share the updates. You are able to read more about each news by clicking on the titles, it will redirect you to the article in our blog. 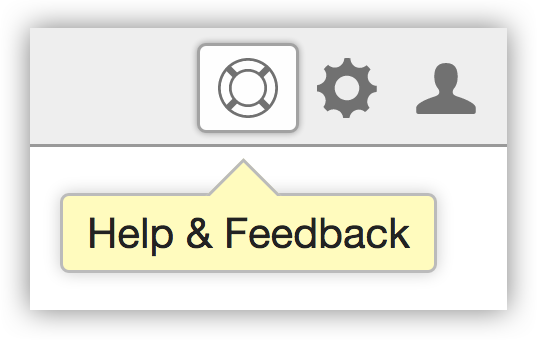 If you have any burning questions or feedback, you are able to fill it in the text-box below the News section and send it to us directly. Alternatively, as seen on the right column of the screen, you can visit our support centre to read up on our help articles by yourself, send an e-mail to us, or request for a personal demo. Below that are our social media accounts. Like us on Facebook, follow us on Twitter or LinkedIn for more real-time updates! In the future, the info tab will be where we run polls to gather our users' preferences and needs.